A major “blue chip” pharmaceutical company approached Stekko with a process challenge. A Canadian based manufacturer of powder micronising equipment had the challenge of identifying a competent. The UK based division of a multi national pharmaceutical manufacturer, appointed Stekko to produce 14 Contained Charging Cartridges. A UK based manufacturer of WFI (Water For Injection) based products, needed two bespoke, mobile pressure vessels designing and manufacturing. Stekko have the skill, experience and ability to manufacture equipment and components to very fine tolerances. These units have been designed and developed by Stekko over the last few years to compliment the company’s range of small and medium sized process vessels. For many years, we have designed, manufactured and installed stainless steel architectural features to both businesses and private clients with exacting standards. A revolutionary product required the dosing of an active pharmaceutical in an explosive environment. Stekko designed and manufactured the solution. 7 units were supplied, all incorporating a 90mm diameter screw auger, a powder chopper and a spherical hopper with agitator. All 3 were driven by plastic, purpose designed and built, pneumatic motors. All the devices were CE marked to ensure operator safety. The client subsequently reported vastly improved efficiency, with a pay back within 12 months. A Canadian based manufacturer of powder micronising equipment had the challenge of identifying a competent, European based producer, who understood the demands of the European Pressure Equipment Directive and were able to implement them. 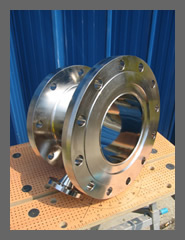 Stekko came to the fore and were commissioned to manufacture a number of Grade 316 stainless steel, containment components for a very high pressure application. Full Notified Body inspection, combined with X Ray testing was 100% successful and the components were despatched to Canada, for inclusion into equipment then supplied in the European Union. Significant cost reductions were realised for the client and Stekko remain a trusted supplier. Bespoke tooling and equipment was designed and manufactured by Stekko, to achieve the demands the client had. Used for the transfer of potent chemicals, between a dispensary and production areas, these Cartridges had exacting levels of internal finish requirements. Stekko was able to produce the equipment, exceeding the clients expectations, whilst doing so more competitively than any other company was able to offer. A further 4 Cartridges were subsequently ordered, illustrating the clients confidence in the abilities of Stekko, to supply bespoke stainless steel equipment. Stekko were appointed to firstly produce a feasibility study and subsequently commissioned to produce the vessels. 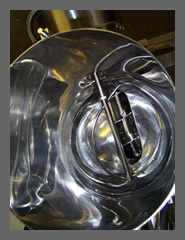 Featuring bursting disc pressure relief, material addition ports, sparge lance facility and sensing ports; these vessels really do have everything and all in a very compact package. 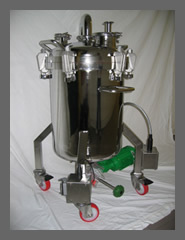 Maximum hygiene, releasability and cleanability within the vessels were prime requirements. 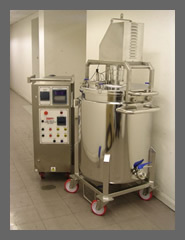 Both vessels needed to be sterilised by an Autoclave process. To meet this need, the vessels were supplied with lifting devices and Autoclave trolleys. Magnetic drive stirrer and PT100 thermocouple were made removable to facilitate the Autoclaving process. Skilled and experienced personnel, combined with exceptional levels of attention to detail, enable us to produce products of outstanding quality and stunning results. These fabricated boxes were manufactured by Stekko, to replace components which the client had previously sourced as a cast brass and plated item. Fabricated from 7 separate pieces of material, it really is impossible to “see the joins” as our client remarked. Tolerances of +/- 0.0002” were achieved over the critical dimensions. This enabled the client to reduce their scrap levels of their finished products, whilst returning a payback within less than 12 months for the client. 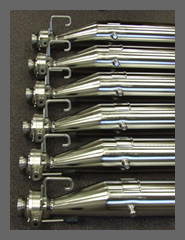 Over 100 of these fabrications have now been supplied and these are in use throughout the world. These units have been designed and developed by Stekko over the last few years to compliment the company’s range of small and medium sized process vessels. Capable of heating & cooling a jacketed vessel’s contents between 0 & 90 degrees Celsius and controlling the temperature setpoint to +/- 0.05 C. They are fully mobile and of a compact size. On board controls allow the control of mixers or stirrers whilst data logging will map the process from start to finish. Staircases, balconies, balustrades, canopies…the only limitation is the imagination! With these projects, we often incorporate glass, natural stone, tension cables and timber as a part of our supply. The end result is often the “WOW! Factor” that clients have been seeking to create. From a simple bracket for a bookcase, to the Design and Build of an entire balcony and staircase……it’s all possible. With many architectural projects, we often find that our liaison with Planning Authority and local Council, takes many of the potential headaches away from the client. Familiarity with the relevant sections (Part K and Part M) of The Building Regulations, enable us to advise the on the correct course of action and design, from the outset of the project.